The efficient functioning of markets requires that economic agents learn rationally from experience, carefully distinguishing signals from noise using Bayes’ rule. However, a growing body of evidence from a range of decision-making environments suggests that agents may be influenced by both the signal and noise components of their past experiences (Malmendier and Nagel 2011, Barberis et al. 2015, Kuchler and Zafar 2015, Fuster et al. 2010, Malmendier and Nagel 2015). What drives learning from noise? The literature has explored a number of possibilities. One is that noise affects decision-making because agents are reinforcement learners – i.e., they pursue actions that have been rewarding in the past regardless of whether these rewards reflect the effects of signal or noise. These simple models are well able to explain laboratory subject behaviour (Charness and Levin 2005, Roth and Erev 1995, Camerer and Ho 1999). A related approach is that agents attempt to update their beliefs, but do so incorrectly, responding to experienced noise that affects cohorts simultaneously (Malmendier and Nagel 2011) or by naively extrapolating from recent data (Barberis et al. 2015). Another possibility is that agents draw introspective inferences from noise, believing that random outcomes are informative about their own ability (Haggag et al. 2018, Kelley 1973, Bem 1965, Fitch 1970, Blaine and Crocker 1993, Gilovich 1983, Gilovich and Douglas 1986). And lastly, noise may be attention-grabbing, which then relates noise and subsequent outcomes (Gabaix 2017, Barber and Odean 2008). In a new paper, we present evidence on how randomly experienced noise affects behaviour in a field setting with experienced participants and explore which of these theoretical mechanisms best explains agents’ responses (Anagol et al. 2018a). During the period of study, India’s stock market regulator required randomised allocation of shares to retail investors in IPOs when they were highly oversubscribed – a setting used in Anagol et al. 2018b. Using administrative data that covers all of the investors’ portfolio holdings before and after the random experience, we track the causal effect of the randomised IPO gain on the actions of investors in the remainder of their portfolios. Our core measures of interest are the investors’ propensity to participate in future IPOs, and trading activity in all stocks other than the IPO stock in the investors’ portfolio – two important immediate domains of decision-making that are important for retail equity market investors. Because the IPO gain is randomised, investors who win the IPO stock and those who do not are identical in their ex ante characteristics, thus leading us to measure precisely the causal effect of a random gain on the investors’ decision-making. In the six months after an IPO lottery, investors who are randomly allotted IPOs that rise in value are more likely to apply for future IPOs. Conversely, they are less likely to apply for future IPOs if the randomly allotted IPO shares fall in value. Similar to previous non-experimental results (Kaustia and Knupfer 2008, Chiang et al. 2011) this connects agents’ experienced noise with future behaviour. However, this finding does not help us to figure out which theoretical mechanism is at work. We therefore test whether these random experiences cause differences in investors’ trading decisions in their remaining (non-IPO) portfolios. We find that investors receiving random gains in the IPO lottery, when compared to lottery losers, substantially increase portfolio churn. Winning an IPO lottery and experiencing random gains makes investors more likely to subsequently buy and sell other stocks. Symmetrically, experiencing randomly allocated losses in the IPO stock decreases portfolio churn. The magnitudes are large—the average experienced gain is around 3.5% of the investors’ portfolio. This treatment causes an average increase of 7.2% in trading volume over the next six months, relative to the control group. These effects are not driven by wealth or liquidity effects—investors gain $62 on average compared to the $1,750 they deposit in escrow accounts to participate in IPOs. And the effects exist regardless of whether investors have large or small amounts invested in the stock market as a whole. Digging deeper into the results, we find little evidence to support reinforcement learning, extrapolative beliefs, mental accounting, or attention as complete explanations of our findings. We also reject the possibility that agents are mistakenly learning about the underlying parameters of the stock return distribution from randomly experienced noise. What then are agents learning from noise? We conclude that our results are best rationalised by agents learning about their own ability from randomly experienced noise. More technically, this explanation best rationalises our finding that agents churn their portfolios more after the experienced random gains, because updates to the agent’s perceived signal precision imply that future signals are seen to be more informative and worth acting on. Put differently, agents appear to misinterpret experienced luck as evidence of their own skill. This is striking—and suggests that we should carefully consider how random changes in environment may affect agents’ decision-making through their mistaken inferences about their own ability. Can agents figure out over time that there is nothing to learn about their own ability from random noise? To better understand this, we explore how investors’ responses to random shocks vary with the extent of their prior participation in the IPO market. Figures 1(A) and 1(B) plot the treatment effect of random wins on future IPO participation and trading volume in non-IPO stock portfolio of the investors respectively. We find a clear negative relationship—investors with four or more past IPO experiences no longer respond to their next random IPO lottery win by increasing their future probability of applying to IPOs (Figure 1A). There is a similar linear decline in the response of trading volume to winning subsequent IPO lotteries, though the effect does not die off to zero even after four or more IPO experiences (Figure 1B). Clearly, there is a striking attenuation in the response to the random shock of winning the lottery with the level of past experience. Why could this be? Investors may respond less to repeated noise shocks as they become jaded. Or particular types of (e.g. sophisticated) investors could select into having more IPO experiences. We attempt to assess the effect of sophistication using controls for proxies such as ‘age’ in the market, ex-ante levels of trading activity or portfolio size. However, we find that the attenuation in the effect of winning the lottery occurs with past experience in the IPO domain rather than with other measures of sophistication. While we cannot, of course, control for unobservable factors driving self-selection, these patterns are interesting in light of prior work on the relationship between experience and market anomalies (as in List 2011, 2003, 2004). They suggest that even if learning in market settings eventually drives out anomalies, theories of learning could profitably focus on the number of times a particular action is performed, rather than on the role of time or other determinants of increasing sophistication. Anagol, S, V Balasubramaniam, and T Ramadorai (2018a), “Endowment effects in the field: Evidence from India’s IPO lotteries”, Review of Economic Studies. Anagol, S, V Balasubramaniam, and T Ramadorai (2018b), "Learning from Noise: Evidence from India’s IPO lotteries", available at SSRN, see VoxEU column. Barber, B M, and T Odean (2008), “All that glitters: The effect of attention and news on the buying behavior of individual and institutional investors”, Review of Financial Studies, 21 (2), 785–818. Barberis, N, R Greenwood, L Jin, and A Shleifer (2015), “X-CAPM: An extrapolative capital asset pricing model”, Journal of Financial Economics, 115 (1), 1–24. Bem, D J (1965), “An experimental analysis of self-persuasion”, Journal of Experimental Social Psychology, (1), 199–218. Blaine, B, and J Crocker (1993), “Self-esteem and self-serving biases in reactions to positive and negative events: An integrative review”, in Self-esteem, pp 55–85, Springer. 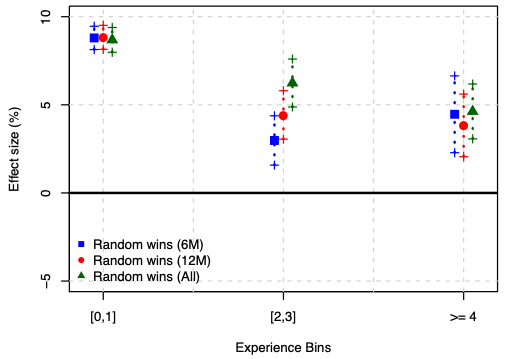 Camerer, C, and T-H Ho (1999), “Experience-weighted attraction learning in normal form games”, Econometrica, 67 (4), 827–874. Charness, G, and D Levin (2005), “When optimal choices feel wrong: A laboratory study of bayesian updating, complexity, and affect”, American Economic Review 95 (4), 1300–1309. Fitch, G (1970), “Effects of self-esteem, perceived performance, and choice on causal attributions”, Journal of Personality and Social Psychology 16 (2), 311. Gabaix, X (2017), Behavioral inattention, Technical Report, NBER. Gilovich, T (1983), “Biased evaluation and persistence in gambling”, Journal of Personality and Social Psychology, 44 (6), 1110. 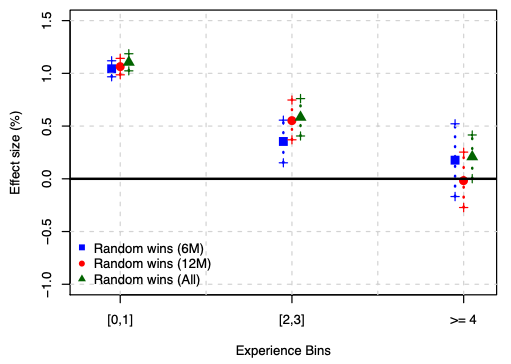 Gilovich, T, and C Douglas (1986), “Biased evaluations of randomly determined gambling outcomes”, Journal of Experimental Social Psychology, 22 (3), 228–241. Haggag, K, D G Pope, K B Bryant-Lees, and M W Bos (2018), “Attribution bias in consumer choice”, The Review of Economic Studies. Kelley, H H (1973), “The processes of causal attribution American”, Psychologist, 28 (2), 107. Kuchler, T, and B Zafar (2015), Personal experiences and expectations about aggregate outcomes. Fuster, A, D Laibson, and B Mendel (2010), “Natural expectations and macroeconomic fluctuations”, Journal of Economic Perspectives. 24 (4), 67–84. Malmendier, U, and S Nagel (2011), “Depression babies: Do macroeconomic experiences affect risk taking?”, Quarterly Journal of Economics, 126 (1). Malmendier, U, and S Nagel (2015), “Learning from inflation experiences”, The Quarterly Journal of Economics, 131 (1), 53–87. Roth, A E, and I Erev (1995), “Learning in extensive-form games: Experimental data and simple dynamic models in the intermediate term”, Games and Economic Behavior, 8 (1), 164–212.